This guide contains citations for print and electronic resources available at Columbia University. Entries for print works include links to Columbia library holdings and to WorldCat records for libraries elsewhere. 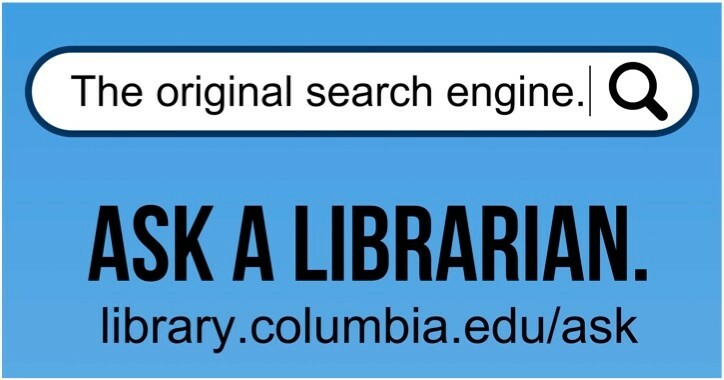 Almost all electronic resources listed here are ONLY accessible to patrons with a Columbia ID. See also: The Novel in Africa guide to resources at Columbia. African American authors, 1745-1945: bio-bibliographical critical sourcebook. Ed. by Emmanuel S. Nelson. Westport, Conn.: Greenwood Press, 2000. African American dramatists: an A-to-Z guide. Ed. by Emmanuel S. Nelson. Westport, Conn.: Greenwood Press, 2004. African American national biography. 12 vols. Editors in chief, Henry Louis Gates, Jr. and Evelyn Brooks Higginbotham. 2nd ed. New York: Oxford University Press, c2013. African American women playwrights: a research guide. Ed. by Christy Gavin. New York: Garland Pub., 1999. African American women writers in the 19th century. New York: The Digital Schomburg, Schomburg Center for Research in Black Culture, The New York Public Library, 1999. African writers. 2 vols. Ed. by C. Brian Cox. New York: Charles Scribner's Sons, c1997. Africana: the encyclopedia of the African and African-American experience. 5 vols. Ed. by Kwame Anthony Appiah and Henry Louis Gates, Jr. Oxford, UK; New York: Oxford University Press, 2005. Afro-American women writers, 1746-1933: an anthology and critical guide. Ed. by Ann Allen Shockley. Boston, Mass. : G.K. Hall, c1988. Black literature and literary theory. Ed. by Henry Louis Gates, Jr. ; [contributors, Sunday O. Anozie ... et al.]. New York : Routledge, 1990. Black literature criticism: classic and emerging authors since 1950. Jelena O. Krstovic, project editor. Detroit : Gale Cengage Learning, 2008. Black women in America. 2nd ed. 3 vols. Editor in chief, Darlene Clark Hine. New York : Oxford University Press, 2005. The Cambridge companion to the African American novel. Ed. by Maryemma Graham. Cambridge; New York : Cambridge University Press, 2004. The Cambridge companion to African American theatre. Ed. by Harvey Young. Cambridge : Cambridge University Press, 2013. The Cambridge companion to African American women's literature. Ed. by Angelyn Mitchell and Danille K. Taylor. Cambridge, UK ; New York : Cambridge University Press, 2009. The Cambridge companion to the African novel. Ed. by F. Abiola Irele. Cambridge, UK ; New York : Cambridge University Press, 2009. The Cambridge companion to the Harlem Renaissance. Ed. by George Hutchinson. New York: Cambridge University Press, 2007. The Cambridge companion to James Baldwin. Ed. by Michele Elam. New York, NY, USA : Cambridge University Press, 2015. The Cambridge companion to slavery in American literature. Ed. by Ezra Tawil. New York, NY : Cambridge University Press, 2016. The Cambridge guide to African and Caribbean theatre. Ed. by Martin Banham, Errol Hill, and George Woodyard. Cambridge; New York: Cambridge University Press, 1994. The Cambridge history of African American literature. Compiled by Maryemma Graham and Jerry W. Ward Jr. Cambridge, UK ; New York : Cambridge University Press, 2011. The Cambridge history of African and Caribbean literature. Ed. by F. Abiola Irele and Simon Gikandi. 2 vols. Cambridge; New York: Cambridge University Press, 2004. The Cambridge history of South African literature. Ed. by David Attwell and Derek Attridge. Cambridge, UK ; New York : Cambridge University Press, 2012. The Columbia Granger's index to African-American poetry. Ed. by Nicholas Frankovich and David Larzelere. New York: Columbia University Press, c1999. A companion to African American literature. Ed. by Gene Andrew Jarrett. Chichester, U.K. ; Malden, MA : Wiley-Blackwell, 2010. A companion to African cinema. E-Book. Ed. by Kenneth W. Harrow and Carmela Garritano. Hoboken, NJ : Wiley-Blackwell, 2018. The companion to African literatures. Ed. by Douglas Killam, Ruth Rowe. Bloomington, IN: Indiana University Press, 2000. A companion to the Harlem Renaissance. Ed. by Cherene Sherrard-Johnson. Wiley-Blackwell Online Books. Hoboken, NJ : Wiley Blackwell, 2015. Contemporary African American novelists: a bio-bibliographical critical sourcebook. Ed. by Emmanuel S. Nelson. Westport, Conn.: Greenwood Press, 1999. Dickson-Carr, Darryl. The Columbia guide to contemporary African American fiction. New York: Columbia University Press, c2005. Dictionary of African biography. 6 vols. Emmanuel K. Akyeampong and Henry Louis Gates, Jr., editors in chief. Oxford ; New York : Oxford University Press, c2012. Dictionnaire des oeuvres littéraires négro-africaines de langue française des origines à 1978. Sous la direction d'Ambroise Kom. Sherbrooke, Quebec: Naaman, 1983. Dictionnaire des oeuvres littéraires de langue française en Afrique au sud du Sahara, v. 2. [par Ambroise Kom ; de 1979 à 1989.] San Francisco: International Scholars Publications, 1996. Dunton, Chris. Nigerian theatre in English: a critical bibliography. London; New Providence, N.J.: Hans Zell Publishers, 1998. Encyclopedia of African literature. Ed. by Simon Gikandi. London; New York: Routledge, 2003. Ervin, Hazel Arnett. The handbook of African American literature. LION--Literature Online. Gainesville : University Press of Florida, 2004. Gikandi, Simon and Evan Mwangi. The Columbia guide to East African literature in English since 1945. New York: Columbia University Press, c2007. Goslinga, Marian. Caribbean literature: a bibliography. Lanham, Md. : Scarecrow Press, 1998. Gray, John. Black theatre and performance: a pan-African bibliography. New York : Greenwood Press, 1990. The Greenwood encyclopedia of African American literature. Ed. by Hans Ostrom and J. David Macey, Jr. 5 vols. Westport, Conn.: Greenwood Press, 2005. "The Harlem Renaissance, 1919-1937," by Paul P. Reuben. Chapter 9 from "PAL: Perspectives in American Literature -- A Research and Reference Guide." Turlock, Calif.: Department of English, California State University Stanislaus, 2008. The heritage series of Black poetry, 1962-1975: a research compendium. Ed. by Lauri Ramey in consultation with Paul Breman. Aldershot, England; Burlington, VT: Ashgate, c2008. Hill, Errol and James V. Hatch. A history of African American theatre. New York: Cambridge University Press, c2003. Jordan, Casper LeRoy. A bibliographical guide to African-American women writers. Westport, Conn.: Greenwood Press, c1993. Kesteloot, Lilyan. Black writers in French: a literary history of negritude. Translated by Ellen Conroy Kennedy. Washington, D.C.: Howard University Press, 1991. Kesteloot, Lilyan. Histoire de la littérature négro-africaine. Paris: Karthala, c2001. Killam, Douglas and Alicia L. Kerfoot. Student encyclopedia of African literature. E-book. Westport, Conn. : Greenwood Press, c2008. Limb, Peter and Jean-Marie Volet. Bibliography of African literatures. Lanham, M.D. : Scarecrow Press, c1996. Lindfors, Bernth. Black African literature in English: a guide to information sources. Detroit: Gale Research Co., c1979. Lindfors, Bernth. Black African literature in English, 1977-1981 supplement. New York: Africana Pub. Co., 1986. Lindfors, Bernth. Black African literature in English, 1982-1986. London; New York: Hans Zell Publishers, 1989. Lindfors, Bernth. Black African literature in English, 1987-1991. London; New Jersey: Hans Zell Publishers, 1995. Lindfors, Bernth. Black African literature in English, 1992-1996. Oxford: Hans Zell, 2000. Lindfors, Bernth. Black African literature in English, 1997-1999. Oxford: Hans Zell, 2003. Mekkawi, Mohamed. African and Caribbean literature in French: guide to research and documentation. Washington, D.C.: Howard University Libraries, 1989. Moser, Gerald M. and Manuel Ferreira. A new bibliography of the lusophone literatures of Africa = nova bibliografia das literaturas africanas de expressão portuguesa. 2nd completely rev. and exp. ed. London ; New York : H. Zell Publishers, 1993. Moudileno, Lydie. Littératures africaines francophones des années 1980 et 1990. Document de travail; no 2.Dakar, Senegal : Conseil pour le développement de la recherche en sciences sociales en Afrique (CODESRIA), c2003. --See also: The Oxford history of the novel in English ; vol. 11. --Content includes: Africana (5 volumes); Encyclopedia of African American history; Black women in America--2nd edition; and, the African American national biography. Oxford Bibliographies Online. Oxford, UK: Oxford University Press. Chinua Achebe. By Evan Mwangi. Chimamanda Ngozi Adichie. By Lily Mabura. James Baldwin. By Magdalena J. Zaborowska. Amiri Baraka. By GerShun Avilez. Black Women Writers in the United States. By Selamawit D. Terrefe. Octavia Butler. By Esther L. Jones. Charles W. Chesnutt. By Charles Duncan. Pauline Hopkins. By Kerri Greenidge. James Weldon Johnson. By Noelle Morrissette. Literature and the Study of Africa. By Evan Mwangi. Modern African Literature in European Languages. By Evan Mwangi. Ngugi wa Thiong'o. By Evan Mwangi. Wole Soyinka. By Alain Ricard. Phyllis Wheatley. By Vincent Caretta. Richard Wright. By Yoshinobu Hakutani. The Oxford companion to African American literature. Ed. by William L. Andrews, Frances Smith Foster, Trudier Harris. New York: Oxford University Press, 1997. Peterson, Bernard L., Jr. Contemporary Black American playwrights and their plays: a biographical directory and dramatic index. New York: Greenwood Press, 1988. Pettis, Joyce Owen. African American poets: lives, works, and sources. Westport, Conn.: Greenwood Press, 2002. The post-colonial literature of Lusophone Africa. Compiled by Patrick Chabal with Moema Parente Augel...[et al]. Evanston, IL: Northwestern University Press; London: Hurst & Company, 1996. Ricard, Alain. The languages & literatures of Africa: the sands of Babel. Translated from the French by Naomi Morgan. Oxford [England]: James Currey; Trenton, NJ: Africa World Press, 2004. Roscoe, Adrian A. The Columbia guide to Central African literature in English since 1945. New York: Columbia University Press, c2008. Twentieth-century Caribbean and Black African writers. First series. Ed. by Reinhard Sander and Bernth Lindfors. Dictionary of literary biography, v. 117. Detroit, Michigan: 1992. Twentieth-century Caribbean and Black African writers. Second series. Ed. by Bernth Lindfors and Reinhard Sander. Dictionary of literary biography, v. 125. Detroit, Michigan: 1993. Twentieth-century Caribbean and Black African writers. Third series. Ed. by Bernth Lindfors and Reinhard Sander. Dictionary of literary biography, v. 157. Detroit, Michigan: c1996. Williams, Dana A. Contemporary African American female playwrights: an annotated bibliography. Westport, Conn.: Greenwood Press, 1998. Williams, Emily Allen. Anglophone Caribbean poetry, 1970-2001: an annotated bibliography. Westport, Conn.: Greenwood Press, 2002. Zora Neale Hurston: an annotated bibliography of works and criticism. Ed. by Cynthia Davis and Verner D. Mitchell. Lanham, Maryland: The Scarecrow Press, Inc., 2013. Contact: Yuusuf S. Caruso, Ph.D.
--Includes essays and historic journals & newspapers. Pascal-Francis Archive: Online Index, 1972-2015. Monthly. (Paris : CNRS, 1972-2015). Interdisciplinary index, with emphasis on Western European publications. Hacker, Diana. The Bedford handbook. 5th ed. Boston : Bedford Books, c1998. Walker, Janice R. and Todd Taylor. The Columbia Guide to Online Style. 2nd ed. New York: Columbia University Press, 2006.